That got me thinking: While there are unfortunately some men who make the decision to be deadbeat and/or absentee fathers, there are scores of us out there who do have the burning desire to be the best dad that they can, however are confronted with a number of barriers that prevent them from doing so. 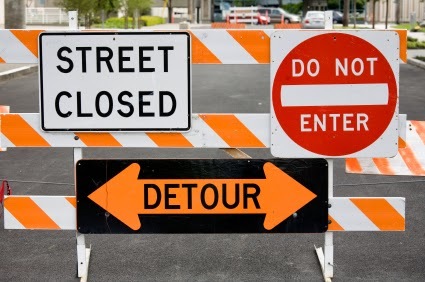 I’ve compiled a list of three of the major barriers to fatherhood (biological, social and self) and helpful ways to overcome them. These ideas were inspired partly from my own experiences and observations. As dads take that journey through the trimesters of pregnancy with their partner, dads will experience a similar range of emotions right alongside her. We get just as excited, nervous and afraid as moms do. We might even gain a little sympathy weight. But no matter how physically and emotionally available we might be, it pales in comparison to the intimate connection that a mother feels as a new life is growing inside her. That connection is further strengthened if she nourishes that life though breastfeeding. Sure, we can feel the baby kick, and while that is definitely awesome (my heart skipped a couple of beats when I felt my son kick back for the first time), it just isn’t the same. Indeed, I can recall moments where I would pick up my crying infant son and he would be inconsolable. That is, until mommy came to the rescue with her nurturing touch and an abundant supply of food. This can be frustrating and may cause many men to assume that babies just “aren’t their thing”. With the exception of breastfeeding, dads can do everything that a mother would do in order to bond with their baby. The key is to start in the early stages of development and take every opportunity to interact with your child. When my wife was pregnant, I would often rub her belly while talking to my son, just to let him know how excited I was to meet him. Once he arrived, I would interact with him by singing lullabies, swaddling him, changing his diapers and holding him skin-to-skin every chance I got. If mom is not nursing, try taking turns taking over the bottle feeding shift. Also, wearing your baby in a carrier around the house or while outdoors is an excellent way to develop a sense of trust between you and your child. I found that wearing my son is a very calming experience for him to the point that, whenever he’s cranky, I jump at the chance to put him in our carrier because I know he loves it so much. It is no secret that when it comes to raising children, our society seemingly neglects to give dads a fair shake. In many popular TV shows and commercials, it’s not unusual for dads to be portrayed as bumbling, clueless, know-nothings around the house who are the de-facto 2nd in command to mommy in chief. Characters that portray such a damaging stereotype poses a danger of unintentionally discouraging new fathers from being as active in their childrens’ lives, especially during the early stages of development. In the workplace, while maternity leave in some shape or form is commonplace, paternity leave is still relatively scarce. That imbalance also further reinforces outdated ideas regarding the expectation of balancing their career and family lives compared to women. In the courtrooms, the female bias is prevalent with custody laws and child support regulations that tend to skew in favor of the mothers. All of these factors are a reflection of our current culture that delivers a clear message to fathers; child rearing is not your job, but rather the mother’s primary responsibility. 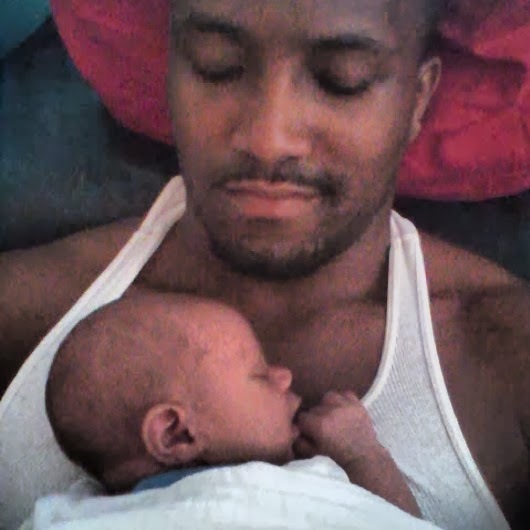 This can be a very overwhelming and disheartening experience for most new fathers. The first step in overcoming this particular barrier is by understanding that a father’s responsibility for his children extends beyond the breadwinner role. In fact, since childcare during any stage is a learned skill, it can be learned by any individual, man or woman, who has the desire to do so through time and experience. With that being said, being accountable by understanding all of the rights that are afforded to us is all the more significant. For example, while not all workplaces have paternity leave, everyone is entitled to FMLA, which allows employees of both genders to take unpaid time off to care for their children without fear of losing their jobs. Do you remember how you felt when you found out that you were going to become a father for the first time? I sure do. I was overwhelmed with a plethora of emotions, ranging from pure elation, to intense levels of fear and anxiety. A lot of my nervousness derived from the lack of confidence I had in my ability to be a parent. After all, as I was barely doing a so-so job taking care of myself at the time; how in the heck was I going to be responsible for a baby? First of all, what you have to understand is from the moment when that baby arrives, he/she is going to love you unconditionally. The fact that you are present in their life and are trying to make a positive impact is an awesome thing in itself, so try not to put too much pressure on yourself. help dads understand pregnancy, their role in that process and beyond. When it comes to fatherhood, there is no such thing as a “one size fits all” approach. These issues are obviously multi layered and can have many solutions, based on individual experiences. However, by opening the floor to discussion, we can expose these barriers and continue to develop ways to overcome them, so we can direct our focus on what’s really important: our family. Since my wife decided that she would give up her job as a teacher to be stay at home mom to our two boys, we’ve been doing our best to be as smart as possible when shopping. Typically, that would mean scouring the internet for the best deal possible before finally making a decision. This method works most of the time, but it can be time consuming and in the case of electronic devices, inefficient. Sure, you can read reviews and compare the specs of specific brands item for item, but until you physically get to test it for yourself, you really won’t get a true feel for whether that product is for you. So, when we decided to look into upgrading our current home theater system, I wasn’t the most optimistic. 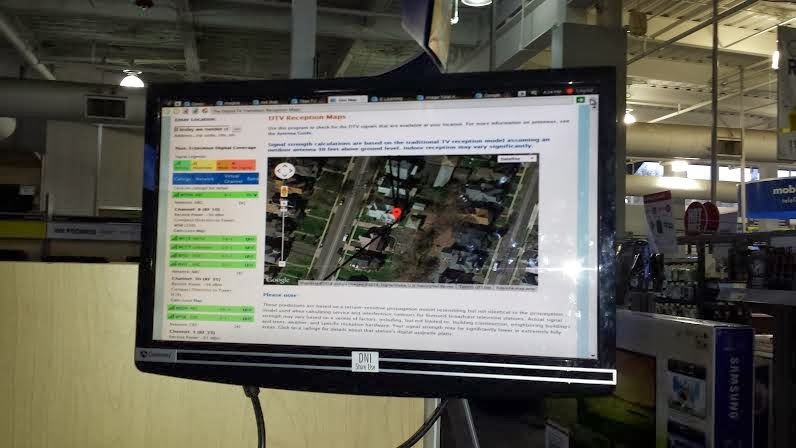 However, we soon discovered that most of our issues were virtually nonexistent after one trip to Best Buy. As soon as we walked into the store, we were drawn in by the spacious layout that encourages exploration of their various electronic displays. We headed over to the Home Theater section, where we were able to check out their Ultimate Showroom. We were then greeted by Frank, a helpful and friendly sales associate who assisted us in navigating the showroom and provided us with great insights on the really cool products that they have to offer. For example, he demonstrated how with a Samsung LED Smart TV, you can use your hand to navigate through the menu to access different applications or change channels. Holy Jetsons, Batman! That blew my mind. The thought of never having to worry about a lost remote was music to my ears. He proceeded to explain how Samsung products and accessories (wireless speakers, Blu-Ray, mobile phones, etc.) are programmed as an ecosystem; they have the ability to “speak” to each other, with the goal of creating the best experience possible for the user. This was particularly exciting news for my wife and me because we are already proud owners of the Samsung Note 3 and Galaxy S4, respectively, as well as a Samsung Blu-ray player, so we’re already moving in the right direction. Soon, we’ll be able to go from watching the big game, to recording it and switching over to a family movie with the ease of texting a friend. They really follow through with with #OneBuyForAll philosophy. Also, it's nice to know that when I am ready to make those larger purchases, Best Buy has a number of services that will help with delivery, instillation and setup. After some discussion, we narrowed our choices down and ultimately zeroed in on the Roku 3, which is a device that connects to your HDTV and streams all types of programming to your home. Since we were interested in setting up Roku 3 in lieu of our current cable service, Frank was nice enough to not only explain the pros and cons of doing so, but he also pulled up our house on their computer and showed us how good of a signal our regular antenna would get should we cancel our cable. 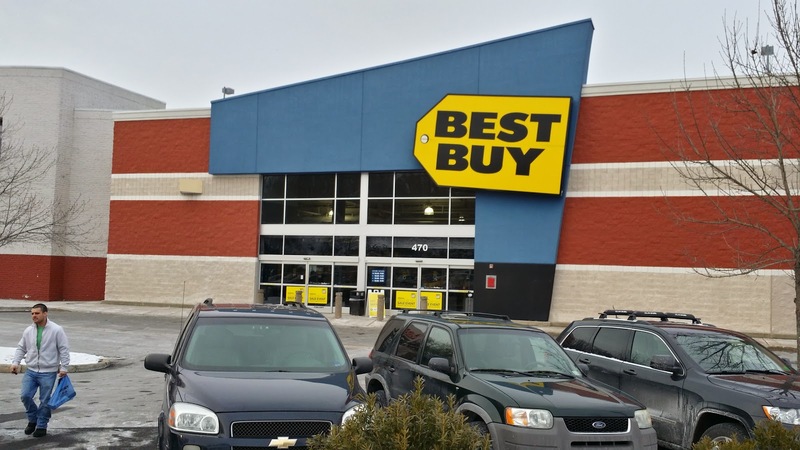 Before we committed to our purchase, we had to make sure we took advantage of Best Buy’s Low Price Guarantee, which basically means that they’ll match any offer that any other retailer has on the spot. 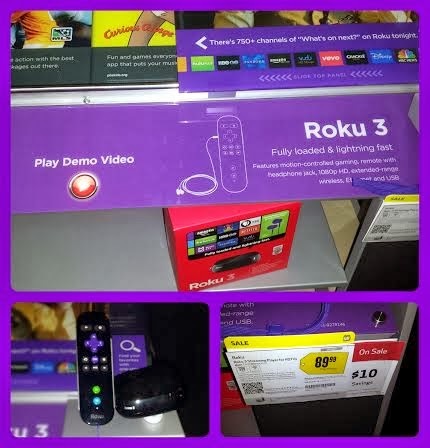 We checked out the other competitors and confirmed that we were indeed getting the best price possible on our Roku 3. We're really looking forward to setting it up so we can continue to enjoy the same quality shows that we currently do, while erasing an expense on our monthly budget. After we made our purchase, we stayed in the store for a little longer to check out some of their laptop/tablet hybrids, as we are also in the market for one of those ever since my 4 year old cracked the screen on our old one by stepping on it (long story... don't ask!). We also checked out some of their gaming systems. I, as well as our 4 year old were fully entertained playing some of the demos as we now have a potential console on our purchase list in the near future. 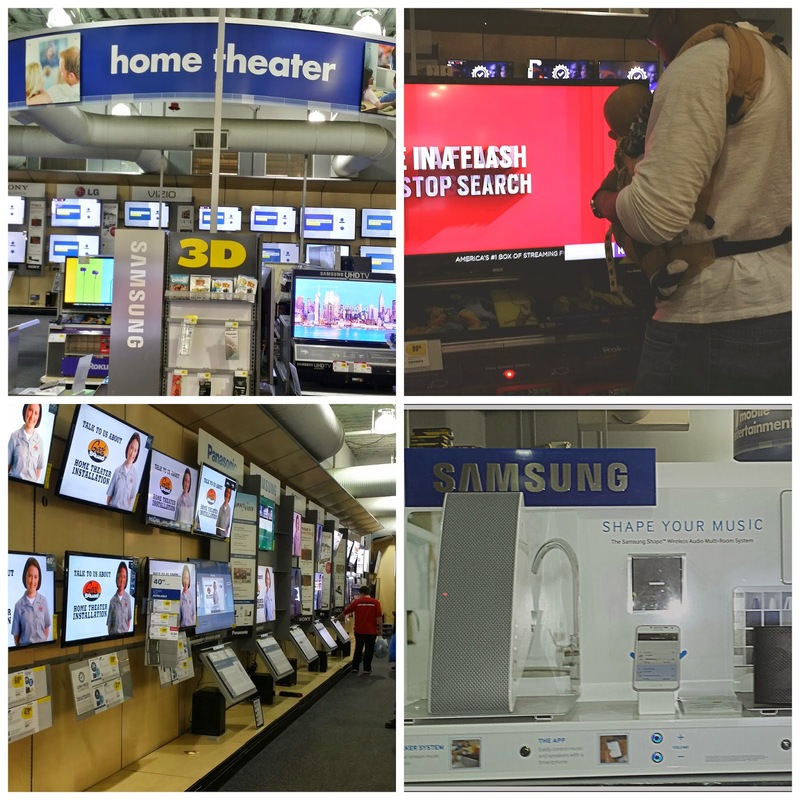 Overall, we were very pleased with our showroom experience at Best Buy. Not only do they have a knowledgeable staff and a very inviting environment, you can be certain that what you're paying for your product is the best because of their price matching philosophy. For a busy family such as mine, anything that you can do to make our lives easier is welcomed! If I could go back in time and talk to my wife right after she had our first child, what advice would I give about interacting with me as a new dad? There are many outdated stigmas that surround men and their relative attitudes towards their partner’s pregnancy. Among this is that with the exception of the occasional foot/belly rub or late-night craving run, dads do not play an essential role during those trimesters and are more or less unaffected. However, that is not always the case. These days, we’re definitely doing more than waiting for the baby to get older so we can start tossing the pigskin around. In fact, as women go through their roller coaster of physical and emotional changes, most dads are right there in the passenger seat with them. Some of us (i.e ME) even tend mirror some pregnancy symptoms, like weight gain. From pre to post natal, it’s all about mommy and baby. We’re often running around doing all we can to ensure the two of you are as comfortable as possible. I think that’s how it should be. However, it is an often overlooked fact that we’re dealing with the stresses, awkwardness and anxieties of becoming a new parent too, the only difference is that there really isn’t a platform for us to express those feelings, and trying to work through that alone can be pretty isolating and lonely. We see you looking in the mirror sideways touching your stomach that at one point was so large, you couldn’t see past your feet. Without even saying anything, we can see the disapproving frown in your face as you secretly curse your baby for what he/she/they did to your body, while mourning over how great you looked pre baby. You probably think that we look at your new body and find you less attractive. You hear us tell you time and time again how beautiful you are, but you simply rebuff those compliments and insist we’re “just saying that because we have to”. And it’s kind of true. But you know what else is true? So, the next time we you hear us compliment you, use our words to reduce your insecurities, because we really, really mean it, you are beautiful. When my wife and I brought our first son home from the hospital, one of my biggest fears was overcoming what I assumed was going to be a massive learning curve compared to my wife. After all, our society teaches us all about maternal instincts, the fabled 6th sense that is infused into a woman’s genome sequence that makes them a superior parent. Fathers, on the other hand are constantly underestimated and viewed as clueless, bumbling creatures that are sometimes considered the unofficial extra child that mom has to take care of. However, despite these myths, the truth of the matter is that both moms and dads start off on equal ground in the beginning, and learn by rolling up their sleeves and doing. That’s why it is so important for moms to encourage hesitant dads to be involved in the childcare process as often and early as possible. Those opportunities will be helpful in helping them discover their individual parenting style. Over time, as you both become more experienced, you will learn how each of the unique strengths compliment each other and make you more of a team. In addition to that, both of your approaches are valuable is helping your child grow up to be a well rounded individual. Overall, just keep in mind that dads need support and encouragement just as much as moms do during this momentous life shift. If you can learn how to provide that both ways as parents, the experience will be that much more enhanced. Congratulations again and good luck! What did you think? Would and of these tips be useful? Did I leave anything out? Comment below!